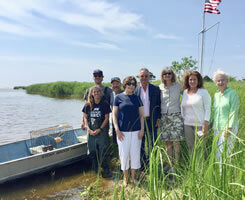 The Society made a grant to the Friends of Georgica Pond to help fund a study conducted by Stony Brook University professor Dr. Brad Peterson researching the environmental impacts of pollutants on the blue crab and fish populations of Georgica Pond. Surface water bodies like Georgica, Hook and Town Ponds are suffering from high levels of nitrogen and other pollutants which cause blue green algal blooms, which can be toxic to all life. The impacts of these types of algal blooms have been devastating to the fin and shell fisheries. As Georgica Pond is governed by Village and Town of East Hampton agencies, information gleaned from this study will be of help in the analysis of other aquatic water bodies similarly affected. 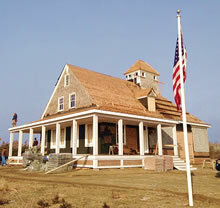 Built in 1902, the Amagansett Life Saving Station has been designated by the Town of East Hampton as an historic landmark. The building was returned to its original site a few years ago after several decades on hiatus as a private residence for the Carmichael family. The Carmichaels donated and moved the building to the Town in 2007. Steeped in the local maritime tradition, the building is the center for ocean rescue and careful monitoring of local beaches. The year 2013 marked the 70th anniversary of the German invasion, which landed four Nazi seamen at Atlantic Avenue beach on June 13, 1943. A young John Cullen, the Coast Guardsman posted at the Life-Saving Station, discovered the invaders while on patrol. This event is marked annually each spring by a reenactment of that fateful meeting, a reminder of an important contribution to the war effort here at home. The building required extensive renovation and the VPS contributed to the purchase and installation of an historically accurate flagpole. The interior will serve as a museum honoring the local tradition of ocean rescue complete with period artifacts. A lecture site and meeting space, the building will also offer office space for lifeguards, and house lifesaving equipment. One of the most prominent structures contributing to the Main Street Historic District is the Gardiner Windmill on James Lane overlooking Town Pond. The fundraising and restoration of this iconic landmark began the Society's preservation efforts, once the preservation of the Gardiner Brown and Beecher Houses had been secured. Built in 1804 by Nathaniel Dominy V, of the famed East Hampton Dominy Family of wood craftsmen, the windmill has been described as unique in the gearing of its under-driven millstones and exceptional quality of craftsmanship. 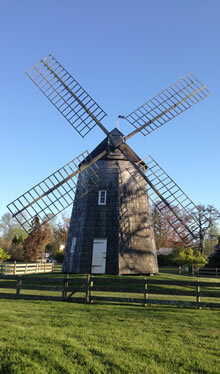 The windmill provided a worthy economic service grinding corn and grain into flour for farmers during its first century. Later, when the windmill and adjacent lands were owned by Winnie Gardiner, it was converted to a bar and cocktail lounge for the entertainment of his guests. The Village eventually bought the property from the current owner, a direct descendant of Lion Gardiner, securing a scenic easement on three acres surrounding the windmill, so it could be permanently viewed from a somewhat original historic perspective. 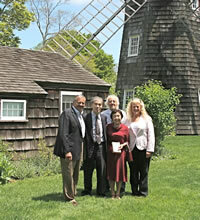 The Trustees of the Village Preservation Society led an effort with Village Mayor, Paul Rickenbach, Jr., to raise over $150,000 to fund the windmill's restoration in 1994. It is one of our proudest preservation achievements. In 1999, the East Hampton Historical Society, owner of the Town House, requested the VPS contribute $14,000 to ensure the Historical Society would qualify for a matching grant from the New York State Department of Parks, Recreation and Historical Preservation for a complete restoration of the structure. Apart from ensuring the restoration of this important East Hampton landmark, the project also marked the formalization of the Society's Grants Program and Committee. A small building adjacent to Clinton Academy on Main Street, the Town House was constructed in 1731 and played a dual role in the community until the mid-1800s. During the day the building was used as a schoolhouse with no books, pens or paper. Students wrote with chalk on slates. In the evening, after school, the Town Trustees conducted the affairs of the Town: levying and collecting taxes, administering public lands, hiring the minister and the teacher, among other responsibilities. 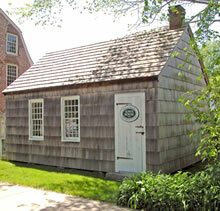 The Town House holds historic records for longevity on Long Island in two ways: it is the only surviving town government meeting place from the Colonial period and is also the oldest one-room schoolhouse. It also housed a variety of other activities and uses including a stint as a barbershop, an interior decorator's studio, a meeting space for Boy Scouts and the town welfare headquarters during the Depression. In the spring of 2012, the Society was asked to consider funding a translation into English of a book written about John Howard Payne by a Japanese math professor, Hido Kawaname, before World War II. Professor Kawaname taught briefly in upstate New York. On his return to Japan, he took up a writing correspondence with then museum director, Ruth Benjamin, furthering his knowledge of John Howard Payne about which he then wrote a book. Mr. Kawaname's inspiration came from the song "Home Sweet Home", which his mother sang to lull him to sleep as a child. Mr. Kawaname's daughter, Toshiko Nishida phoned Village Historian, Hugh King, from Japan, to tell him that she had a copy of the book. The book reflects on aspects of John Howard Payne as lyricist of the song, "Home Sweet Home", which is very popular in Japan. Ms. Nishida described her father's need to write as all-consuming and a somewhat puzzling endeavor in post-war Japan, as simple things such as paper and pen were so hard to come by. Additionally, the book is written in the archaic Japanese language, familiarity which is dying out with the generations for whom it was most common. The book was translated by Miyuki Shibasaki, a teacher's aide in Montauk. 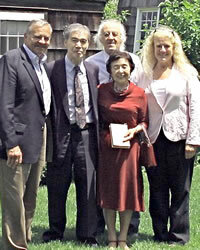 Pictured here are Mr. and Mrs. Nishida, on their first trip to New York from Japan, with Village Historian, Hugh King, Mayor Rickenbach and VSP Executive Director, Kathleen Cunningham. Mrs. Nishida is holding a copy of her father's book in her hands. 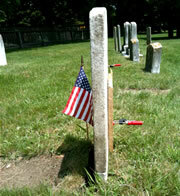 The Society funded the restoration and repair of the headstones at the North End Cemetery this year. Historically, sandstone was the stone of choice for many graves, but it is vulnerable to erosion. Lichen growth also weakens it. Many stones suffered damage from storms, a vehicular crash and lawn maintenance mishaps. The stones were repaired using an historically accurate method, corroborated by the Village Historian and completed by a professional in the field of headstone restoration. . 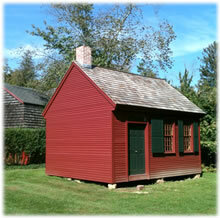 The Hook School House, a small 18th century building moved from a North Main Street property, is on Main Street behind the Clinton Academy and The Towne House. As part of the Historical Society’s “Living History Project”, it will be outfitted to simulate an 18th century school room in East Hampton. Richard Barons, director of the Historical Society, explained that while the building will not be definitively identified as a school, “it possesses many of the characteristics of typical South Fork frugality in making do with refreshing and reusing older structures.” The “Living History Project” will develop a program in coordination with the NY State Social Studies syllabus, with enthusiastic support from East Hampton teachers. The VPS funded the re-roofing of this building by Richard Baxter, completed in April of 2010. The North End Cemetery is home to the graves of East Hampton residents who served in the wars of Independence, 1812, Civil War and both World Wars. 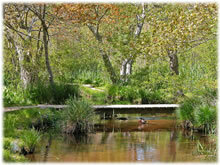 The land is owned by the Town of East Hampton, but is maintained by the Village. 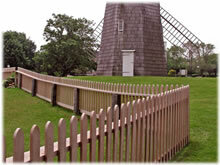 In partnership with the Town and the Village, the Society funded the purchase of historically accurate wood for the fence, which was installed by the Village. Replacement of this fence helped to restore respect and dignity to this hallowed ground. 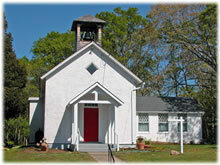 St. Peter’s Church served the Springs community. The bell in this church dates back to the Civil War. When the belfry, which housed this historic bell needed replacement, the Society provided a matching grant to the Church to fund the work. As in every community, East Hampton has been shaped by its long relationship with the land and sea. The farmer/fishermen of East Hampton share a long tradition of working the land and the sea for a living. 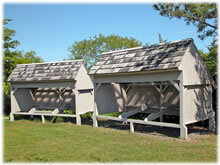 The Town of East Hampton helped to preserve some of the vintage boats used by East Hampton mariners for centuries. Now a dwindling enterprise, many of these vessels are on view at the Town Marine Museum on Bluff Road in Amagansett. The Society built two shelters to protect these historic vessels from the elements while they are on view during the summer season. 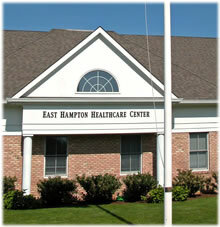 The East Hampton Healthcare Foundation gave birth to the East Hampton Healthcare Center. Founded in response to the first Quality of Life Survey of the membership of the Village Preservation Society in 1997 which identified lack of access to quality healthcare among the top three quality of life issues for Village residents. VPS Trustees were the founding members of the East Hampton Healthcare Foundation which enabled healthcare professionals to open practices in our community and expand services offered, which now includes specialists in cardiology and mammography facilities among its many offerings. The Duck Pond on Davids Lane has long been a source of pleasure for Village and Town residents alike attracting families who enjoy the water fowl that resides there. The many beautiful plants species, originally landscaped and later donated to the Village by Mrs. Wodehouse, had many non-indigenous species which began to overrun those wetlands. In league with the Ladies Village Improvement Society (LVIS), the LVIS helped to restore indigenous plantings to the area to help balance the eco-system.